Columbia Records and Legacy Recordings, the catalog division of Sony Music Entertainment, are prepping the release of Bob Dylan – Trouble No More – The Bootleg Series Vol. 13 / 1979-1981 on Friday, November 3rd. The set is the latest chapter in the label’s highly acclaimed Bob Dylan Bootleg Series that showcases the music Dylan wrote and performed during one of the most surprising, controversial and inspired periods of his career. As the 1970s ended and the 1980s began, Dylan responded to the changing of the decades with a three album trilogy — Slow Train Coming (1979), Saved (1980) and Shot of Love (1981) — of spirit-filled songs of praise, worship and devotion. These songs were as deeply personal and packed with poetics as any Dylan had ever written, but the force of conviction and power of faith evident in these performances baffled segments of Dylan’s fan base (just as Dylan’s “going electric” had alienated folk purists in 1965). 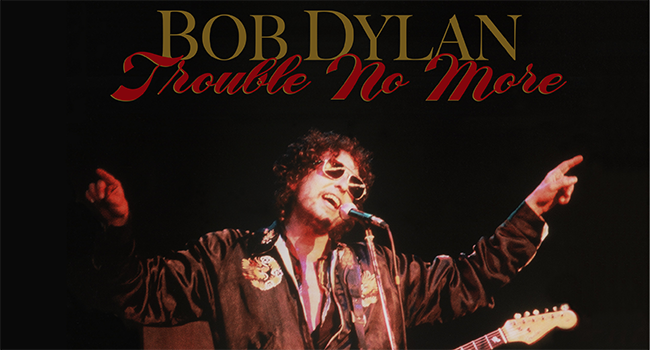 Available exclusively on the deluxe box set is a DVD which includes Trouble No More: A Musical Film, a new feature-length cinematic presentation combining unreleased footage from Dylan’s 1980 tours with new material written by Luc Sante and performed by Academy Award nominee Michael Shannon. Directed by Jennifer Lebeau, Trouble No More has been selected to premiere at the prestigious 2017 New York Film Festival. Bonus extras on the box set’s exclusive DVD include a rare performance of “Shot of Love” from Avignon 1981 and more. Bob Dylan – Trouble No More – The Bootleg Series Vol. 13 / 1979-1981 will also be available in 2 CD and 4 LPS configurations featuring the first two discs from the deluxe box.